I have created a ticket booking form. I'm using "FORM_STATUS" field to trigger the workflow. Once the form is saved it has "FORM_STATUS" = Blank hence the workflow doesn't get triggered. The main purpose of the workflow is to send an email to the user who has submitted the form and also send an email to general office where this form has been submitted(multiple users submits form to general office). Problem is I can trigger a workflow by selecting start workflow when an item is created. But I don't want the workflow to send email once the list field is created. I want it to send email only when the "FORM STATUS"='In Progress'. I have used IF CURRENT ITEM FORM_STATUS=In progress then send an email to general office. But once I submit the form and the status changes to "In progress" the workflow doesn't trigger. 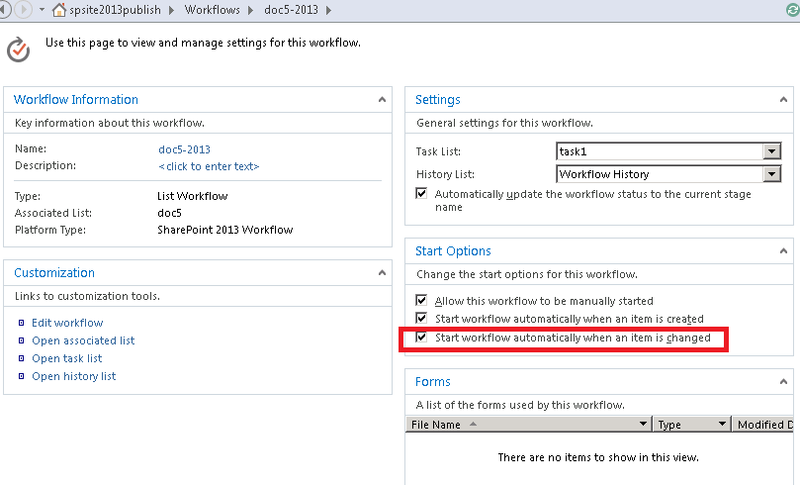 In the workflow settings, in the start options, you could select the option “Start workflow automatically when an item is changed.”. It will trigger workflow when the item is updated. Not the answer you're looking for? Browse other questions tagged sharepoint-online sharepoint-enterprise sharepoint-designer if-condition or ask your own question.